Lamaze collaborates with several strategic licensing partners who believe in our mission, support our vision and share our values. Whether your purchase is for yourself or for a baby shower gift, you can be sure it is a high-quality product and that you are giving back—helping moms and babies everywhere. Your purchase supports education and advocacy for safe and healthy pregnancy, birth and parenting around the world. Sign into your Amazon account at smile.amazon.com. Select “Your Account” from the top navigation bar or use this direct link to select a charity: https://smile.amazon.com/gp/chpf/change. Search “Lamaze International” and select the Washington, D.C. option. 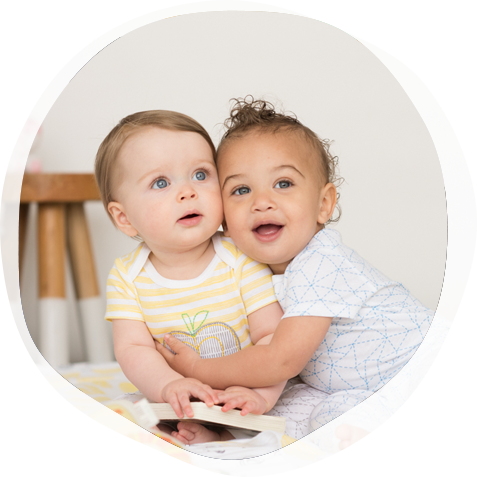 Lamaze Organic Baby-Wear is brought to you in partnership with Kitex Garments, one of the world’s leading manufacturers of infant apparel. We commit to providing safe, quality and 100% organic cotton, made in a Global Organic Textile Standard certified, transparent and sustainable supply chain. Offering premium knitwear with the softest touch and bright, vibrant colors, Lamaze Organic Baby-wear offers a full range of styles including bodysuits, coveralls, pants, sets, sleepwear and accessories. Lamaze toys and soft books—sparking little triumphs for babies and for parents—are brought to you in partnership with TOMY. Created with child development experts, Lamaze toys pioneered the developmental infant category more than two decades ago and are now trusted leaders in encouraging daily discoveries through independent and shared play. Lamaze toys encourage babies to grow and develop through features that promote together time between parent and baby and activities that encourage baby to explore and learn independently. The high quality, bright colors, friendly faces, crinkly fabrics and contrasting patterns of Lamaze toys make them a favorite of parents, babies and experts. Designed to spark little triumphs at every stage of baby’s development, Lamaze toys have received more than 200 awards. Lamaze maternity intimates are offered in partnership with PPI Apparel Group. Built on the premise of fashion and function, the intimates collection offers a complete line of maternity and nursing bras as well as sleepwear and camisoles. As a premier brand in the maternity industry, the Intimates line complements the Lamaze approach to pregnancy and breastfeeding. Birth is transformative and every family deserves a safe and healthy birth experience. Our goal is simple; we want all parents to feel confident, supported and powerful as they ask questions, make decisions, and navigate their path through pregnancy, birth and parenthood.